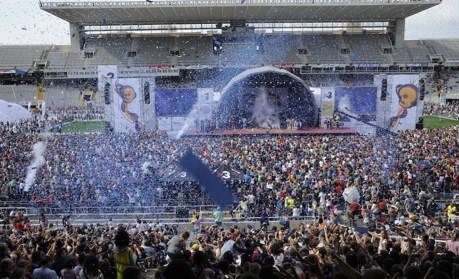 The 17th edition of the “Supers” Party, organized this year with the cooperation of the Barcelona city council, has managed obtain a tremendous participation success, with more than 330,000 children and families meeting in the Olympic Ring of Montjuïc the weekend of October 19th and 20th. During these 2 days all the children enjoyed participating in a lot of free activities and shows. Music, dance, and magic were just a few of the events on the site, and also lots of activities were organized by the companies who supported the event, Zeta Espacial among them. Peta Zetas® has participated in the party organising a fun, sweet and very surprising activity for the youngest children, and the elaboration of a “POPPING CUPCAKE”, with participation of more than 4,000 children. With easy ingredients, a cupcake, chocolate syrup and Peta Zetas® (Pop Rocks®), they created a very funny afternoon snack. Also at the end of the activity all the participants got their pack of Peta Zetas®, which was a sweet reward for their creativity. In 2014 Zeta Espacial celebrates the 35th anniversary with a complete calendar of activities and promotional events.